We use a mechanistically based ecosystem simulation model to describe and analyze the spatial and temporal patterns of terrestrial net primary productivity (NPP) in South America. The Terrestrial Ecosystem Model (TEM) is designed to predict major carbon and nitrogen fluxes and pool sizes in terrestrial ecosystems at continental to global scales. Information from intensively studied field sites is used in combination with con-tinental-scale information on climate, soils, and vegetation to estimate NPP in each of 5888 non-wetland, 0.5° latitude x 0.5° longitude grid cells in South America, at monthly time steps. Preliminary analyses are presented for the scenario of natural vegetation throughout the continent, as a prelude to evaluating human impacts on terrestrial NPP. The potential annual NPP of South America is estimated to be 12.5 Pglyr of carbon (26.3 Pglyr of organic matter) in a non-wetland area of 17.0 x 106 km2• More than 50% of this production occurs in the tropical and subtropical evergreen forest region. 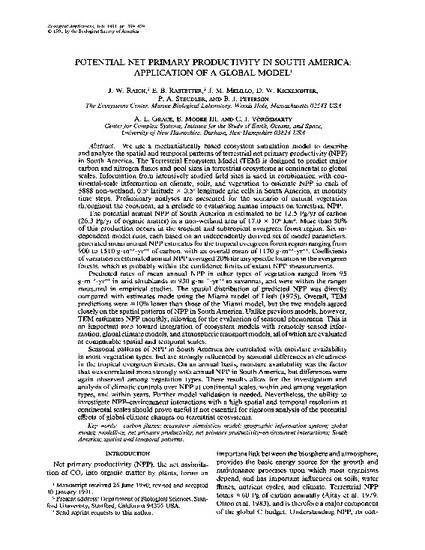 Six in-dependent model runs, each based on an independently derived set of model parameters, generated mean annual NPP estimates for the tropical evergreen forest region ranging from 900 to 1510 g·m-2·yr-1 of carbon, with an overall mean of 1170 g·m-2·yr-1• Coefficients of variation in estimated annual NPP averaged 20% for any specific location in the evergreen forests, which is probably within the confidence limits of extant NPP measurements. Predicted rates of mean annual NPP in other types of vegetation ranged from 95 g·m-2·yr-1 in arid shrublands to 930 g·m-2·yr-1 in savannas, and were within the ranges measured in empirical studies. The spatial distribution of predicted NPP was directly compared with estimates made using the Miami model of Lieth (1975). Overall, TEM predictions were ｾ＠10% lower than those of the Miami model, but the two models agreed closely on the spatial patterns ofNPP in South America. Unlike previous models, however, TEM estimates NPP monthly, allowing for the evaluation of seasonal phenomena. This is an important step toward integration of ecosystem models with remotely sensed infor-mation, global climate models, and atmospheric transport models, all of which are evaluated at comparable spatial and temporal scales. Seasonal patterns of NPP in South America are correlated with moisture availability in most vegetation types, but are strongly influenced by seasonal differences in cloudiness in the tropical evergreen forests. On an annual basis, moisture availability was the factor that was correlated most strongly with annual NPP in South America, but differences were again observed among vegetation types. These results allow for the investigation and analysis of climatic controls over NPP at continental scales, within and among vegetation types, and within years. Further model validation is needed. Nevertheless, the ability to investigate NPP-environment interactions with a high spatial and temporal resolution at continental scales should prove useful if not essential for rigorous analysis of the potential effects of global climate changes on terrestrial ecosystems.